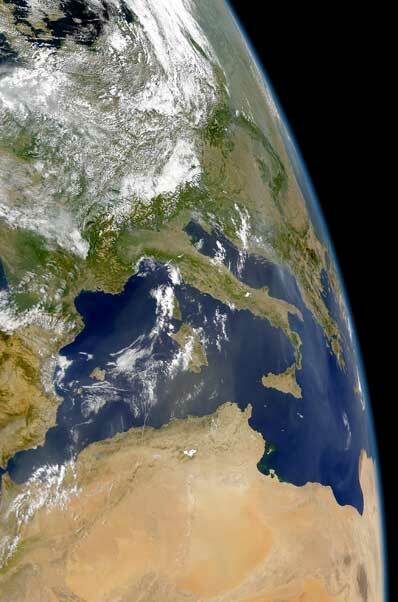 This SeaWiFS view of the western Mediterranean shows dust from the Sahara desert and smoke in the Balkans. Provided by the SeaWiFS Project of the NASA/Goddard Space Flight Center and ORBIMAGE. The mission of the NASA Goddard Space Flight Center is to expand knowledge of the Earth and its environment, the Solar system and the Universe through observations from space. The purpose of the Sea-viewing Wide Field-of-view Sensor (SeaWiFS) Project is to provide quantitative data on global ocean bio-optical properties to the Earth science community. ORBIMAGE is a leading global provider of geospatial imagery products and services, with a constellation of digital remote sensing satellites complemented by data from other optical, aerial and radar sources.